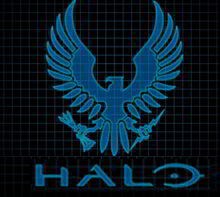 The Halo series of games is centred around an interstellar war between humanity (specifically the UNSC - United Nations Space Command) and a theocratic alliance of aliens known as The Covenant, who worship an ancient race called The Forerunners, who killed themselves and almost all known life in order to starve their enemy, parasitic alien life forms called The Flood, to death. The player-character in the games is Master Chief John-117, a UNSC supersoldier known as a Spartan. Since the original game, Halo Combat Evolved, there have been 9 games, a wealth of novels and comic book adaptations, a failed attempt by Peter Jackson, Peter Schlessel and Neill Blomkamp to make a live action movie, and a forthcoming live-action TV series, with Steven Speilberg acting as executive producer. In this section, youll find all of our official Halo merchandise, including official Halo 4 t-shirts and an official Halo 4 hoodie. Halo 4 UNSC brushed ..
Halo 4 In The Stars ..
Halo 4 The Return t-..